BentoLunch.net - What's for lunch at our house: Post #100 - Lunch! Now, if I had been organized, I should have done something cool for post 100, but I just realized that this is post 100 when I went to click on post on Blogger. So nothing interesting, just a Faith lunch. Thanks for sharing the ham and cheese muffin recipe. I made them the other day and my family (including almost 4 year old daughter) just love them. 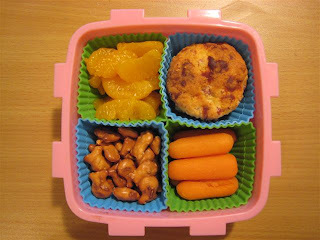 And they are perfect for me to send to school if I use a mini muffin tin!